Since SFRplus (and eventually eSFR ISO, which uses almost all the same settings) is included in IT EXE and DLL, users may sometimes need to examine or edit the INI file used to control IT versions. Most of the settings in the [sfrplus] or [esfriso] section are set by one of the three SFRplus or eSFR ISO Settings windows that can be opened when SFRplus is run in Rescharts (or by clicking SFRplus setup in the Imatest main window). A few are set by responses to other windows or user actions. Settings that affect only Rescharts mode (and hence do not affect SFRplus Auto or the IT versions) will be highlighted in pink. When Rescharts SFRplus is opened, typically by pressing SFRplus setup, the main SFRplus settings window is opened. Two additional windows can be called from the SFRplus settings window. You can toggle between them or return to the settings window. only affect SFRplus Auto (or IT EXE/DLL) runs. They do not affect Rescharts (interactive) runs. (gr) Affects graphics (figures). May not be of interest for Imatest IT, where graphics is often suppressed (by setting disable_figs = 1 in the [api] section). (index) Setting is equal to the index of the popup menu. You’ll need to open the Settings window to see these: rarely for important IT settings. 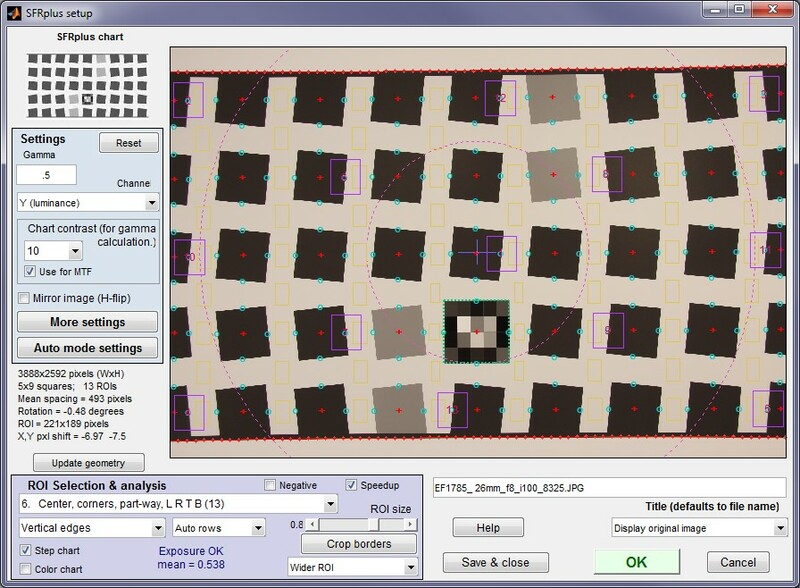 anlz_rough ♠ Analyze roughness 0 or 1  Analyze edge roughness if 1; leave at 0 for speed if not needed. (real number) Normally from EXIF data. May be manually entered in More settings for ISO speed calculation. areanorm ♠ Area display normalization [2 2] See Secondary Readout settings. camera Camera type (text) Normally obtained from EXIF data. Does not need to be populated. chcontrast ♠ Chart contrast index & use [1 0 0] Element 1: Chart contrast index. 7 for contrast=10; 9 for contrast = 4, etc. 3: 0 or 1. If 1, use chart contrast to determine gamma for MTF calculation. closefigs Set by the Close figures after save checkbox in the Save window. 0 or 1  1 recommended for IT (closes windows after save). colorspace ♠ Color space sRGB Color Space name. Used in color chart analysis. 1 = Separate CSV files for individual ROIs. 2 = Save summary CSV file only. 3 = Combine ROIs into one large CSV file. distort_params Distortion parameters for pre-distorted chart [0 0] Parameters for pre-distorted charts. If non-zero, the correct distortion and Field of View is calculated (chart distortion is compensated). edgeIDfile Edge ID file ” (empty) File for specifying Edge IS. Used only for roisel = 15 or 16. Instructions here (Scroll down to Region selection). gamma ♠ Gamma (input) (Settings area) [0.5] Used to linearize image. Initial setting. lenschart Lens-to-chart distance in cm. Used for angular Field of View (FoV) calculation (but not FoV in cm) and for focal length estimate. mod_apod Use “modified apodization” noise reduction. Not ISO standard, but recommended because it reduces sensitivity to noise. n1090 Index that specifies rise distance  1 for 10-90(% rise distance), 2 for 10-80, 3 for 10-70, 4 for 20-80, 5 for 20-70.
pixelsper pixels/distance or um/pixel, depending on pixunits_value (numeric string) [”] Must contain a valid number for units of cycles/mm, etc. pltrad (Rescharts window when Radial CA plot is displayed) [1 1 1] Parameters for Radial Chromatic Aberration plot. Best omitted (use default values). pltsharp ♠ Std. sharpening dropdown menu 0-2  Standardized sharpening: 0 = omit; 1 = plot std. sharpening (not recommended); 2 = plot oversharpening only. radius ♠ Radius slider (near oversharpening)  Radius for Standardized sharpening (if selected). Not recommended. roi Set during region selection (primarily in the fine adjust window) 1 1 3264 2448 (typical) Region of interest (crop) in pixels. [x1 y1 x2 y2] Groups of 4, each group corresponding to a number in nht_save and nwid_save. roisel Region selection 1-17 Determines which regions are selected for analysis. Described in ROI selection : Center, 2: Center, corners, etc. See the ROI Selection dropdown menu in the SFRplus settings window. saveCSV Save window 0 or 1 [-99 = ignore] Save CSV results. Overrides save_file_list. saveJSON Save window 0 or 1 [-99 = ignore] Save JSON results. Overrides save_file_list. saveXML Save window 0 or 1 [-99 = ignore] Save XML results. Overrides save_file_list. SFRsuffix Suffix… popup menu in Options II window 1-3  Information added to root file name for saving results. geometry_recalc Shift dependent geometry recalculation 0 or 1  If set, geometry will be recalculated if the edge locations are close to the edge locations in the previous image. speedup ♠ Speedup (checkbox in Settings area) 0 or 1  Speedup removes detailed noise and histogram calculations as well as SQF/Acutance calculations. speedup = 1 is recommended if these are not needed. zweights Weights for calculating weighted means for MTF, etc. [1 .75 .25] [center part-way corner] weights (30%, 75% of center-to-corner distance defines regions.) Default is for pictorial images; corner would be higher for technical images.